Teaching (and Learning) More About Marmots: RMBL's marmot project is currently in its 50th year. Because of our long track record and and because marmots are such fascinating animals, Team Marmot has many lessons to pass onto the next generation of scientists. 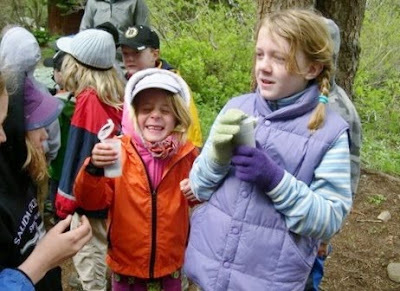 Each year, team marmot shares its passion for understanding ecology with young and aspiring naturalists at RMBL's Kids Nature Camp. This season two marmoteers from the University of California Los Angeles helped students to gain key insights into the secret world of marmots. 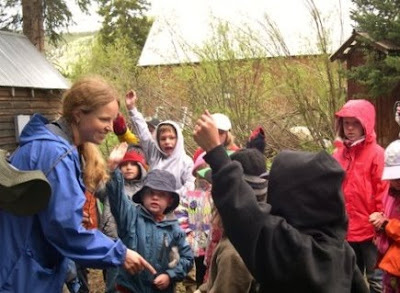 Jenn Smith (in photo above, quizzes students about marmot ecology) is an American Association of University Women Postdoctoral Fellow and Nicole Munoz is a National Science Foundation Predoctoral Fellow. They first demonstrated the techniques used to observe and live-trap marmots. Then, Jenn and Nicole explained how they perform manipulative experiments to understand how marmots cope with their social worlds and natural threats. For example, students learned how researchers assess whether or not marmots are capable of distinguishing among the different cues of predators. One highlight from this training exercise occurred when students were asked to distinguish among the predators producing various vocalizations and scents (see above). Students were amazingly astute at distinguishing between coyote and deer urine. After marmot week at RMBL, these inquisitive students are now armed with new knowledge of and enthusiasm for understanding the natural world. We have a yellow belllied marmot that we have nursed back from near death and is now part of the family. The problem is that he is losing all his hair on the back half of his body. There are no sores and it doesnt seem to bother him but we are worried and are looking for help. There are very little resources and local vets are no help. Anything you could suggest would be wonderful. This will be a very good opportunity for the students to collect the information and knowledge of nature. By the way the kids in these pictures are very cute. I am very thankful to you for this blog. Because i could never make my students and even now my own kids to like maths as a subject. But with these tips i think i can do it now. For pupils, learning the best way to Write an MLA format research paper can be vital. Most colleges need Students to organize a MLA format research paper. Students possess the liberty To research any topic however, if put all of the origin citations from the newspaper. persuasive research paper outline is the best one option to proofreading your writing. Thanks for sharing this Updates and Random Observations with us. I like how you thinking about. You really a good writer. Here personal statement for podiatry school are some writing tips for you.